Today, we split into our two discrimination groups, age discrimination and disability discrimination. Today, we discussed the different ways we could campaign against this discrimination and came up with a rough manifesto. Today, we discussed what to do. 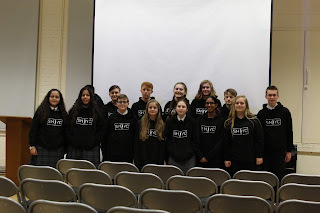 We came up with campaign videos where we would like to ask the youth with a disability.If you think you fit this, please email us at contact@surreyheathyc.org.uk for further details. At the end of the project, we would like to present to all of the councillors. We had a brilliant time today running SHYC’s first ever Youth Conference on Curriculum for Life. It was amazing to hear all the positive feedback and very inspiring to hear from our wide range of speakers including HireHigher, Royal Holloway, Camberley and District Job Club, University of Surrey and more. Thank you so much to Gordon’s School, all our speakers, Camfest, and of course the #iwill fund for making events like this a possibility. We hope to see other boroughs following in our footsteps and inspiring their young people to start reaching out for opportunities in life. If you are interested in seeing what went on at the event, check out our YouTube channel for some clips taken from the livestream. Our recent consultation of Surrey Heath young people found that they wanted better preparation for life after school. We have created this event to inform young people in Surrey Heath about the different paths they can take, such as studying at university and apprenticeships; how to be more employable; and how to look after your wellbeing at the same time. The event is designed to be accessible for all young people interested in the topic. The event will run from 1:30pm - 4:30pm on 22nd January. Watch live here, or on YouTube (https://youtu.be/4WZuYYS-4SM)! University of Surrey:What is life like at university? Sharing the experience of students. HireHigher:Workshop on transferable skills and what makes a good CV. 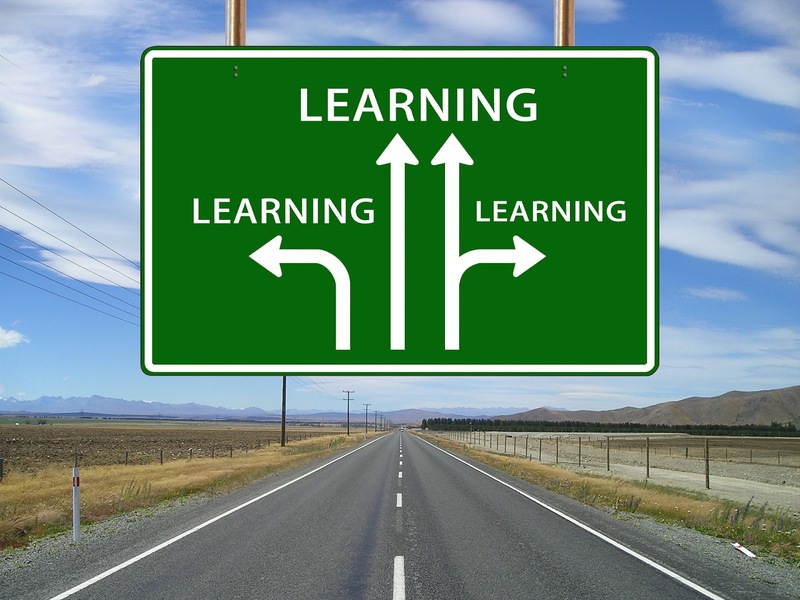 Royal Holloway:What are the links between higher education and work? Patrick Kinsella:How he created his business and how you can do the same. Murray Rowlands:Alternative avenues into work and how to know what opportunities suit you. Curriculum to prepare us for lifeBullyingCost of livingSafety at nightDiscrimination Over the next two years we are attempting to tackle these issues - starting with our Preparing for Working Life project which aims to give young people: skills for life (including CV writing, cooking and money management); knowledge of how to improve personal wellbeing; and insight into further education and apprenticeships. You can download our full manifesto for 2018/2019 here which details what the five issues encompass. Follow us on social media for updates and to join in on the discussion. Craig Alford attended the Surrey Heath Youth Council meeting to raise awareness of Surrey Youth games. I was interested in how Craig was expressing his opinion about fitness and the well being of individuals. In addition to this I decided to volunteer to promote the Surrey Youth Games in my school as I believed it would have a substantial affect on the lives of young people. I shared flyers with students in my school, I approached students at my school and told them about the Surrey Youth Games and encouraged them to join in and participate. I know one of my peers attended the boxing sessions as well. Hello everyone, thank you for reading our blog. We are more than excited to start the term but, due to GCSE’s we have lost a few members due to revision. So that means the time has come again to recruit new members to join our team of young people here at the Surrey Heath Youth Council. We are recruiting young people aged 11-18 from all schools across Surrey Heath but are trying to gain a wider representation from schools such as Tomlinscote, Gordon’s, Kings, Carlwarden, Collingwood and Farnborough Hill to improve our links with these schools. If you are interested in joining simply fill out our application form or read more about joining the SHYC here. 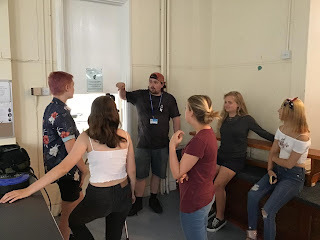 We have been focusing on Education within our Preparing for Working Life Project and have researched, compiled and published information for the easy access of young people. The information includes CV Writing, Further Education - such as Apprenticeships as well as Exam Stress and Revision. This is so that the young people of Surrey Heath have knowledge of the different types of opportunities accessible to them. Make sure to check it out at: Further Education Information! The Surrey Heath Youth Council had a great time today at Tenpin in Camberley for our end of term celebration. If you haven’t yet, have a look at our Education Information on apprenticeships, universities, CV writing and more! 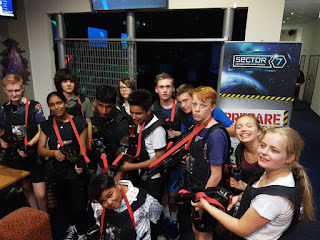 We played two games of Sector 7 laser before eating and looking back over our achievements this year. The SHYC will start looking at the second item from our consultation ‘Safety at Night’ next term and we have already met with local PCSOs about street lighting. Today the SHYC held an extended meeting to work on compiling resources for our education project which can be found here on our website. 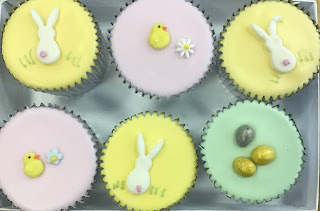 Additionally, we worked on completing cooking tutorial videos which we will begin editing to be able to present in local schools and on our website. We hope that you like our new Education Resources and will keep an eye out for our videos in the future. The term has now finished for SHYC and we will continue working on our first manifesto point ‘Preparing for Working Life’after the summer. We are currently looking to recruit young people from Surrey Heath to ensure we have a wide representation. If you are interested see this page on our website. As always, follow us on social media for the latest updates. 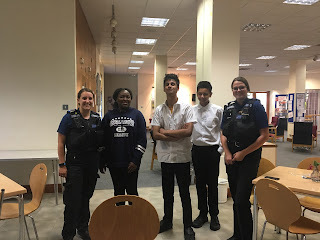 Members of the Surrey Heath Youth Council had a great meeting today with Community Support Officers Fiona and Marita from Surrey Heath Police. We talked about Safety at Night in the local area- one of the top 5 issues in our recent consultation and part of our manifesto! Our discussions were really productive and it has helped us with new ideas of how to link in with the police and other organisations to improve the reach of our second manifesto item ‘Safety at Night’. Today at the Youth Council meeting we talked to Craig Alford about the Specsavers Surrey Youth Games 2018. He spoke to us about recruiting new young ambassadors to promote the Youth Games events. We were also joined by Councillor Rodney Bates from the Old Dean. He dropped in to see how the Youth Council was operating. Our Chairs read out our current emails and we looked at our actions for today's meeting, one of these was thinking about inviting the police to discuss safety at night. After this, the members of the Youth Council split into three groups for our current project Preparing For Working Life. These groups include Personal Wellbeing, Education and Skills for the Future. 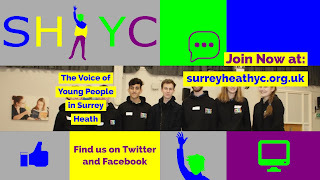 We recently held a special cream tea event to inform all the Surrey County Councillors and Surrey Heath Borough Councillors what the Surrey Heath Youth Council does and how we represent all young people in Surrey Heath. This will help us to improve our links and enable us to better spread our message and take action on the issues we found in our survey. The top issue we identified from our recent survey was that young people want a curriculum to prepare them for life. We are planning to take action on this in our next project. Our new project for 2018 is all about helping young people prepare for the future through a number of different mediums. We want to help young people get skills for the future and the world of work, give them the resilience and personal wellbeing to help them be successful and also give them insight into further education. To achieve this we have formed three groups: Skills for the Future, Education and Personal Wellbeing and are now planning how we can best tackle the issue. You can download our full manifesto for 2018/2019 here. Follow us on social media for updates and to join in on the discussion! 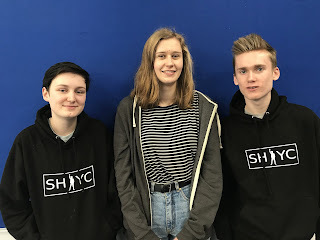 The Surrey Heath Youth Council recently ran their first Anti-Stigma Conference at Collingwood College. 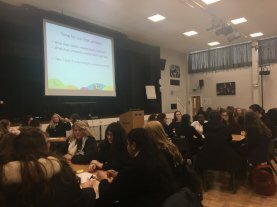 The event aimed to educate and inform young people in Surrey Heath about the seriousness of mental health illnesses and how to help those struggling with them. The conference was live-streamed to enable as many people as possible to benefit from it.